business owners recognize the importance of websites and written content, all too often, entrepreneurs unknowingly overlook a key ingredient to success with their Internet marketing in Chicago: corporate videos. As a leading provider of successful solutions for Internet marketing in Chicago, the team at Design & Promote knows that including corporate videos in an online promotional approach can prove an invaluable resource…when effectively leveraged. 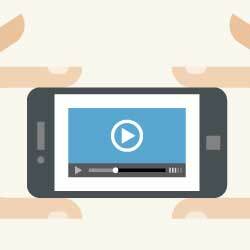 Many corporate executives find themselves reluctant to include videos in their strategies for Internet marketing in Chicago. What’s a common initial concern for these partners? They worry that their videos will simply get lost in the online shuffle. With so many online videos being posted each and every minute, it can be difficult to garner the attention your company deserves. At Design & Promote, we believe that any online content, regardless of the form, must be top quality in order to yield the best results. Our team of strategists will work with your staff to outline the focus and objectives of every piece you post. To inform, entertain and/or compel; whatever your specific goals, we will help you create content to reach your goals by targeting your distinctive business niche with trendsetting, noteworthy content. Much like our copy-centric campaigns, our video strategies also include keyword focused titles and tags. When working with us, we’ll help you include video titles and tags that will instantly boost the online rankings of your uploads. Many of our partners are surprised to learn the major impact that transcription and closed-caption files can have on the popularity of their corporate videos. Using transcription in your videos will help search browsers more easily find them as well as strengthen SEO rate of return. Of course, getting viewers to watch your videos is just a piece of the puzzle for success with Internet marketing in Chicago. We can help you place your specific calls to action in a noticeable, yet unobtrusive place on the video, in addition to giving your viewers as much information as possible so they can take the next steps. Finally, when working with us to create your comprehensive video strategy, we will work with you to create a playlist URL that encompasses all of your videos. Your playlist URL will automatically go to the next video in your list to increase overall viewership. Sharing your playlist URL will help all of your videos get the attention that they deserve. For more information about our strategies for Internet marketing in Chicago, reach out to us today!